Today, the City will publish an information report detailing the alignment and design of the Hamilton light rail transit lines. Today, the City will publish an information report detailing the alignment and design of the Hamilton light rail transit (LRT) lines. The report will be presented to the Light Rail Transit Sub-Committee at their May 2 meeting. The design was prepared in partnership between the City's LRT Coordination office and Metrolinx, with technical assistance from transportation consultant Steer Davies Gleave. According to Paul Johnson, Director of LRT Coordination for the City, the team's overriding design objective has been to design a system that is "rapid, reliable and safe". This has guided their decisions in working through the various constraints and challenges across the length of the line. The design is refreshingly free of the awkward compromises that hobbled the previous design in an attempt to preserve the status quo. As Johnson said in an interview with RTH, "If we're going to build this, let's build this." Now that the preliminary design is going public, the City and Metrolinx will undertake a broad, extensive consultation process with residents and stakeholders to incorporate local expertise and fine-tune the plan. LRT will operate on two tracks in the centre of the street, one track eastbound and one westbound. Perhaps the biggest change from the previous design was to move the alignment to the centre of the street instead of along the south curb, and to switch King Street from one-way westbound vehicle traffic to two-way vehicle traffic (with a couple of exceptions). LRT vehicles will have signal priority at intersections, meaning that traffic signals will be designed to hold green or quickly cycle back to green if an LRT vehicle is approaching. In addition, station boarding platforms will be located just past the intersection, so that the vehicle will pull through the intersection and let passengers on and off on the far side. This is called a "far side platform," and it helps reduce delays by ensuring that the vehicle can take off immediately after the last passenger has gotten on or off instead of getting stuck behind a red traffic signal. It also coordinates the traffic signals so that people will be able to cross King Street after disembarking. With the advent of LRT, King Street will no longer be an arterial road for through traffic. Instead, it will mainly serve as an access road for local traffic, with the arterial role taken over by the LRT line. Major intersections will allow vehicles to make left turns across the LRT tracks, but some minor intersections will not. This restriction on turning movements has led to some consternation, but it's important to remember that with King Street going two-way, there will be a significant addition of new turning movements for vehicles turning eastbound onto King. Starting at the west end, the line will begin on Main Street West at Cootes Drive and run in the centre lanes, with two lanes of traffic on either side. The line will no longer loop through McMaster campus, in order to ensure that there is enough distance between the LRT line and the university's electron microscope that vibrations and electrical interference from the line won't affect the equipment. The McMaster transit terminal, currently on Cootes Drive north of Scholar's Road, will be moved to the corner of Main and Cootes, where there is currently a surface parking lot. It will include up to 14 bays for HSR, GO Transit and other regional bus services. McMaster is also investigating the possibility of incorporating a new building above the terminal. 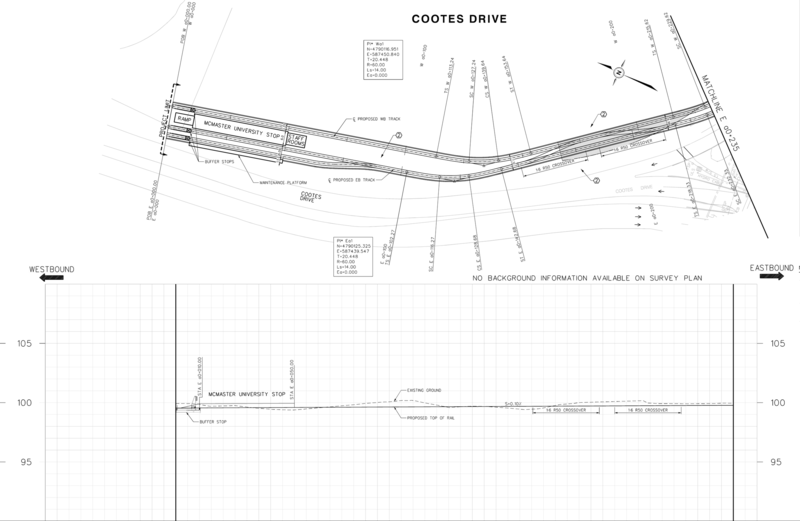 Originally, the LRT plan called for stations at both Cootes Drive and McMaster University Medical Centre, but the decision was to eliminate the McMaster Medical Centre because it is so close to Cootes and having two stops in close proximity works against the goal of a rapid system. The plan calls for bike lanes on Main Street in addition to the two-way LRT line and four lanes of vehicle traffic. The specific design of the bike lanes have not yet been finalized: they could be painted one-way lanes on either side of the street, physically protected one-way lanes on either side of the street, or a physically protected cycle track or multi-use path on one side of the street. With a street as busy as Main West, it is a no-brainer that any cycling infrastructure should be physically protected from vehicle traffic. For example, parents in Ainslie Wood thinking of biking with their children to school in Westdale will not be willing to do so if the only protection from two lanes of vehicle traffic is a painted line. Whether that makes more sense as one-way cycle tracks on each side of a two-way cycle track on one side will be determined through further design work. After Cootes Drive, the next LRT station stop will be at Main and Longwood Road, and that is the last stop before the line crosses Highway 403. This seems like a long distance between stops, and there may be a decision through the public consultation process to add in another stop in West Hamilton, possibly in the area of Dalewood Avenue. East of Macklin Street South, the LRT line will veer off Main Street just past the Beverly Hills Apartment building to a new dedicated overpass that will cross Highway 403 and join King Street West. From there, the LRT line will proceed down the centre of King Street with one lane of vehicle traffic on either side, one eastbound and one westbound. However, King Street will no longer function as an arterial through street. The line will pass the MacNab transit terminal and cross the north-south tracks of the A-Line (about which more below), but the two lines will not cross-connect. Passengers switching from the B-Line to the A-Line will have to transfer. There will be some impacts for vehicle access to the various underground parking garages in the Bay - James segment, and one option is to convert Summer's Lane to two-way vehicle traffic. The plan also calls for a higher-order pedestrian corridor linking the LRT with the current Hunter Street GO Station. Staff originally envisioned that it would run up MacNab Street from the MacNab Transit Terminal and east on Hunter to the GO Station, but now they are leaning toward running the pedestrian corridor up Hughson from Gore Park. There will be a couple of locations along King where vehicle traffic will be restricted to just one lane, particularly through the International Village between John Street and Wellington Street. In this stretch, the LRT line will run next to the north curb with just one eastbound lane south of the line. The reason for this alignment was to allow vehicle access to businesses on the south side of King, which was an important issue identified by business stakeholders. On the north side, businesses will be able to achieve vehicle access via an east-west alleyway running between King and King William. Staff are studying an alley improvement strategy. One option for the eastbound lane on King through this stretch is to design it as a pedestrian-friendly "shared space" in a manner similar to Hess Village or King William Street. Another option for local access and loading/unloading is through side streets - Catharine, Mary, Walnut, Ferguson and Spring. Again, it makes sense to convert more of these streets to two-way, especially considering that they will likely not be through streets at King. East of Wellington, the LRT line will run in the middle of the street with a lane of traffic on either side. The Scott Park station will be extra-wide to allow for heavy capacity of passengers travelling two and from events at Tim Horton Stadium. One challenge will be the CP rail line that crosses Main Street diagonally at Gage and crosses King at East Bend Avenue. It is still an active line and can cause delays of up to eight minutes when a train is crossing. Ward 3 Councillor Matthew Green is looking at options to take the line out of service, given the current impacts on quality of life for local residents. Moving east to the Delta, where King and Main crisscross, it will likely be necessary to reconfigure the intersection to make it safer and less confusing for all users. At this point, the LRT line will switch back to Main Street East. At Delta itself, the decision was made to remove the proposed station, although this may be reconsidered during the review and public consultation stage. The line will run in the centre lanes of Main with a lane of traffic on either side until it ends at the Queenston Traffic Circle (QTC). This eastern terminus is not ideal from an operational point of view, since it does not serve as a significant transit hub today. For the time being, express bus service will continue east along Queenston Road to the transit terminal at Eastgate Square. This was originally supposed to be the eastern terminus of the LRT line, but a decision was made to end the line at Queenston and add a north-south spur connecting the B-Line to the James North GO Station. This decision connects the LRT line to regional rapid transit, which is a mandate of the Province, and it also neutralizes the vocal opposition of Ward 5 Councillor Chad Collins, who enthused, "East Hamilton businesses have dodged a bullet" when the announcement came that the line would stop at QTC. However, the Province has made it clear that the current route is only phase one and that the line will be extended to Eastgate Square in the future. The property immediately adjacent to QTC on the east is the former City Motor Hotel, which the City expropriated in 2013 and had planned to develop into a dense, mixed-use building. Now, the thinking is that it will be used as the location of the eastern terminus for the LRT line, with bus connections to the B-Line express and other local routes. One possibility is to combine the two plans with a development that includes a terminal on the main floor and residential units on upper levels. The challenge is that this terminal is intended to be temporary until the line is extended to Eastgate, so it would have to be designed in such a way that the main floor can be adapted for a different use once it is no longer needed as a bus terminal. The LRT plan also includes a north-south spur connecting the B-Line to the James North GO Station. This spur is effectively the first part of the city's planned A-Line rapid transit, which is currently served by an A-Line express bus service. The decision was made to put the A-Line LRT directly on James Street. This is the most direct path to the James North GO Station, and if there is enough room in the budget it will allow the line to be extended all the way to the waterfront at Guise Street. Unlike the B-Line, which will run on its own dedicated lanes, the A-Line will run in mixed traffic on James, streetcar-style. This minimizes the need to expropriate properties along James and allows the street to continue its grassroots revival. While running in mixed traffic is not ideal from an operational perspective, the distance is short enough - and vehicle traffic is moderate enough - that there won't be much difference in speed between mixed traffic and dedicated lanes. Also, the B-Line and A-Line routes will not be cross-connected, so vehicles on one line won't be able to transfer directly to the other. As a result, passengers wanting to switch lines will have to get a transfer at King and James. One notable absence from this information report is a decision on what, if any, changes need to be made to the street network to accommodate westbound vehicle traffic. The transportation consultant is currently undertaking detailed traffic modelling studies based on the addition of LRT on King to determine the availability and need for westbound traffic capacity. The most obvious solution is to convert Main Street to two-way. Main is currently five lanes of one-way eastbound traffic, a design that is deeply harmful to street life on Main. Thanks to the "platooning" of vehicle traffic due to synchronized traffic signals, the street alternates between waves of roaring traffic and ghostly silences. During the ill-fated transit-only lane pilot, it was impossible not to notice that Main Street sat mostly empty during periods when King Street was backed up. This is a waste of scarce, expensive public right-of-way. However, staff will not make a decision about possible changes to the road system until after the traffic modelling study is completed some time this summer. This would be a terrible idea. It would undermine the multi-modal transportation system of which LRT is supposed to be the centrepiece, and it would turn many cycling advocates against the LRT plan when they should be natural allies. It would be particularly cruel to remove the city's best piece of cycling infrastructure merely in order to preserve the grossly damaging one-way orientation of Main Street. It would go directly against the staff imperative to design for transformational success rather than designing to preserve the status quo. This is a preliminary design report, and it will be further refined in the coming months as the city undertakes a broad, extensive public consultation process to engage residents and stakeholders. Improving the bike lanes on Main West to be physically protected. This has not yet been finalized, and there is an exciting opportunity to do something really transformative with the bike lane design. Adding or moving stations. The distances between stations are very long in West Hamilton, between Scott Park and Ottawa, and between Parkdale and Nash. The frequency of stations has to be balanced with the desire for rapid movement - too many stations will slow down the service, but too few stations will make it inaccessible. Adding more dedicated pedestrian crossings. Under the current plan, there are some fairly long stretches with no pedestrian crossings. It will make sense to engage with local residents to determine the best places to add more crossings. For example, Pearl Street is already a de facto north-south pedestrian and cycling greenway connecting Strathcona and Kirkendall neighbourhoods, and there should be a safe LRT crossing here. Improving cross-street access. Most secondary cross streets will not have left-turning access onto King, but some of these may be up for reconsideration if safety concerns can be addressed. In addition, it will make sense to convert more of these streets to two-way traffic in order to allow vehicles to find sensible paths through the downtown. Over the next few months, the City will consult extensively with stakeholders - including visiting every property and business along the line twice a year until the LRT is completed - to incorporate local expertise and fine-tune the design. Finally, it's important to note that this is an information report, not a request for permission. The Province is footing the bill for this project and Metrolinx owns its design and implementation. This is emphatically not an occasion for Hamilton City Council to try and micromanage the file. Doubtless, there will be a few councillors who will seize the opportunity to play wedge politics, but it must be stressed that they do not have the final say in this design. [T]he City and Metrolinx are working in partnership to deliver the project. The City was the sole proponent for the 2011 [Environmental Assessment], but per the recently approved Memorandum of Agreement for the project we have agreed that the City and Metrolinx will be co-proponents for the EA Addendum process. None of this changes the role of Metrolinx in the project. We will continue to manage the procurement process (together with Infrastructure Ontario), oversee the construction of the project, and will ultimately own the project once it is completed and in service. The addendum to the Environmental Assessment will be completed between September 2016 and spring 2017, and that will include many formal opportunities for feedback through public information centres (PICs), stakeholder meetings, telephone town halls and other forms of engagement. Update: the agenda for the May 2 LRT Sub-Committee meeting has gone live. It includes the LRT Alignment information report, but we can't link to it directly because the City's committee website is unusable-by-design, but it's item 8.1 under Discussion Items. Hope Hamilton does not follow the footsteps of corrupt, do-nothing mayor Watson in Ottawa. He gave the LRT contract to snc lavelin, the worlds most corrupt engineering company. When Watson built the so-called new Landsdowne Park, the seating capacity is a pathetic 24,000 !!!! A little larger than a hockey arena. Oh yeah, also, what moron puts up a a stupid condo tower in the end zone of a football field !!?? Watson does. Really !!??? All courtesy of kaybecers doing the job !!! Watson, Gatineau's other mayor !!!!! First, Lansdowne Park was mayor Obrien's folly and it is friends that created the sole sourced plan that became the contract for Lansdowne Park, Watson simply inherited that file. Second, the CFL only wants stadiums of 20,000-35,000 capacity because that's all they can fill anymore! Why do you think the Argos left Rogers Centre and is moving into BMO Field. Although SNC is a somewhat dogy company, most international engineering company's the size of SNC Lavlin that have to operate in many third world, strongman controlled hellholes are, it goes with the territory. The LRT project office not the mayor, chose the Rideau Transit Group. This is a Consortium of 12 companies, in which SNC Lavlin is a minor partner and engineering contractor, it's not even the main contractor. Today its very common for Consortiums or groups of companies to bid on LRT contracts as a way of offering a one size fits all solution to cities that have never built or managed a major rail transit project like this. I have to admit Bombardier's track record on the TTC streetcars isn't so spectacular either. Anyway, it appears Canada is probably going to do a stealth-bailout of of Bombardier via purchases for GTHA's fully funded $13.5bn electrified GO RER and the newly announced Montreal's electrified SkyTrain-style system, plus VIA's new $4bn electrified HFR system which already apparently has funding interest (Canada's various pension funds, OTPP/CPP/etc, which apparently also owns some European HSR assets). And, apparently, if Hamilton/West Harbour GO electrification happens (found Metrolinx mention) as a future phase of GO RER, we'll be able to reach Ottawa and Montreal completely on electricity by the end of 2020s -- not just Toronto. Regardless, this is an exciting rail boom, indeed! I wish the Spec et al. noted that King would still be a vital arterial road, just not for cars! Thanks for the overview Ryan, exciting times for Hamilton with this and the waterfront plans! To be fair, many Metrolinx detractors mention UPX as a case study against the LRT. While UPX has admittedly been bungled in many ways, they finally are modifying UPX rapidly to be part of Toronto's transit system now. Ridership has skyrocketed (more than doubled) now that they dropped fares to exactly match GO fares, and you can tap on a GO Presto reader to board UPX now, treating it like a GO train. For electrification they are likely going to merge UPX into the general RER plan, with lower-cost transit style operations when they electrify it as part of the funded $13.5bn GTHA GO RER plan. Buckle up everyone. The resistance to this transformation from the Old Guard is sure to be no holds barred. Annnnnnd the province ruined it! What's 'rapid and reliable' about mix-traffic streetcars along James Street? I talked to Paul Johnson yesterday at the TMP meeting. They confirmed it would only be mixed traffic on a short stretch of A-Line. The A-Line extension (when funded eventually) south of King would not be mixed traffic. This keeps trips from Mountain to Downtown very fast -- it only slows down on the fancy part of James St N.
Still don't see the A-Line rationale, TBH. I get that Metrolinx is obligated to cater to the government's whims, but not convinced that resources are better spent on an A-Line spur than, say, extending the B-Line west to the West Village Suites or east to the RHVP. Nobody is willing to walk 15 minutes along James (except on the second Friday of every month), but everyone is expected to walk 5 along Hughson? I completely agree. It's a bit of a farce to say the A-Line spur will provide "regional connections" when the Hunter Street Terminal will have all-day, two-way GO Service under the RER while West Harbour will be peak-only- especially since Hunter St is so close as it is. I feel like terminating the service at Queenston will just inconvenience riders between there and Eastgate who are used to a one-seat ride. This also "commits" the mountain A-Line to be LRT even though the feasibility study metrics showed that BRT would perform better overall. I would anticipate a James+HunterGO LRT station once the A-Line extends southwards. I'm not in a big hurry to take a transfer and wait on a connection to spare myself a three-block walk. As I noted in the article, the distance of the A-Line spur is short enough that there isn't much difference in speed between LRT on dedicated tracks and LRT in mixed traffic. It becomes a lot more important over the 11 km distance of the B-Line, which is why it runs exclusively in its own right-of-way. Will the trains loop around the Queenston Traffic Circle or is more space needed for a turning radius? One proposed plan was to eliminate the Queenston traffic circle and create a two-way intersection. LRVs on the Hamilton LRT are double-ended and reversible. No turning loops needed. My understanding is that each end of the line will be a "double-ended crossover". The benefits to this design are: it takes up less space, makes for quicker turnaround and makes it easier for the line to be extended in future. This doesn't have as much wear-tear issues as double crossovers. That's too bad, double crossovers are very expensive and difficult to maintain from a railway operations perspective. Just ask the TTC! Although 2 single turnout crossovers requires a lot more space, it is a far, far cheaper option that tends to work better in the long run especially, if you have double ended vehicles and want quick turn around at single or double stub ends. James St is the only street in this city I have ever seen congested. It can happen any time of day. James Street routing for A-Line is a mistake. The current plan doesn't even connect both GO stations. They want riders to walk three blocks. A true missed opportunity. Meanwhile Hughson St remains empty of cars and people. That would be the standard Hamilton definition of congestion which means a driver is forced to remove their foot from the accelerator and (gasp) slow down and perhaps even (double gasp) stop for a red light. Or just blast right through the red light. Another good trainspotting spot is Corktown Park where your kids can swing on the swings while watching a massive freight train slowly make its way thru the trees about 50ft away. Never mind the road warriors, the real fun for LRT supporters will be the construction starts in 2019. Especially, if your city has not seen a big construction project in a while. The road warriors will really start to cry and then demand changes that, will either delay, stall or force the project over budget! Which is a common last ditch trick, including court injunctions, to try and stop LRT projects. There is a whole arsenal of new tricks like this that sprouted because of road/sprawl favoring politicians and business owners! Were already seeing a funny switch around here in Ottawa. Conservative suburban politicians who were anti LRT during the, "should we build it or not debate", are already complaining that LRT Phase 2 will not include their wards. Recently, there has been a lot of development announced by developers and retail corporations around what will be future phase 1 & 2 stations. Suburban councilors who doubled down on sprawl development and a "maybe a Transitway connection sometime in the future" position during those past debates are now eating their words. One nearly had me thrown out of City Hall when I quietly reminded him of his past statements on the LRT file. Won't Phase Two construction along Queenston Rd drastically slow the Eastgate to QTC express bus? I think they're studying bus diversion routes. Barton, Cannon, etc. Was the SDG analysis of the A-Line stump released alongside this plan? Both King and Main should be converted to two way but I think having the LRT ON Main St would have made more sense. Furthermore, perhaps John to Hunter to Bay would have been better for the A Line as that route can be used for a line going up the mountain in the future. Regardless, any LRT is good news and I am happy to see some progress! I have always felt the best route was Main and down to Ferguson or Wellington to the TH&B and out their tracks elevated above them to the rail trail from Aberdeen all the way to Dundas. I bet it would cost way less, service the same or a greater number of people and be way less disruptive. Meanwhile, the commentators on CBC are mostly negative, but the CBC poll at the bottom (still active as of April 27th) is mostly positive. Most residents don't want to tend with vocal anti-LRT posters. Great, very informative article, thank you Ryan! And thank god this is NOT in the hands of Hamilton. Great work Metrolinks, we love you! Metrolinx is ruining this important project, specifically by replacing Queenston Rd-Eastgate portion with a not-yet needed A-Line spur LRT. This is going to hinder B-Line ridership. This is not going to help get those in Riverdale or Stoney Creek out of their cars. Best case scenario is if we can somehow convince Metrolinx that the best regional connection would be extending B-Line to Centennial GO via Eastgate Square, and getting them to drop the A-Line spur until a later date. This is what LRT proponents should be lobbying for over the next several months. Definitely want an Eastgate extension. It's on the map as Phase 2! But the politics of trying now could end up hurting the B-line. Both the councillor and MP are anti-LRT. If you look at Ottawa and Kitchener-Waterloo, you can see they got incremental funding for their Phase 2 extensions while Phase 1 is still under construction. Same for Calgary, Edmonton, and many other cities. Even Toronto may get Crosstown extension funding before its first phase starts operation. Or wait until it is up and running and the people of Ward 5 are mad as hell that they are not included in the success. Who will take my wager that there will be no shortage of people in Ward 5 who will whine and throw a tantrum about having to transfer to the LRT after taking a feeder bus to get to the end of the line. They won't whine or complain, they'll get in a car instead. And that's the problem with this current alignment. Centennial Neighbourhood planning meeting today at 630pm. Chad will be there so people can tell him what they think. Yes they have Jim. Like you they are in the deluded vocal minority. I still think making James 1-way and keeping King 1-way would have been best for the LRT. You'd be able to keep a dedicated ROW on James, keep street-side parking on James and on King, and with the LRT splitting the road its functionally two one-way streets anyways. I mean, we keep talking about "access for businesses" but is a narrow 1-lane road with no stopping really going to help them any? With a 1-way, the road would be wide-enough in most spots to allow stopping/parking. Either way, I'm excited to see we keep making forward motion on this, and that Metrolinx is prioritizing progress over dithering. I mean, I also would've preferred a Main alignment, but I'd rather see something built regardless. Doing James 1-way would have meant ripping out those nice streetlamps, cutting down all trees, and removing all public art from James St N.
It's my understanding (if I am not told incorrectly) that James will remain a 2-lane street, with 1 lane per direction for BOTH LRVs/cars. So it's a 2-way street for cars and LRT. Like a TTC streetcar but only for those few blocks. The "1 lane per direction" (which is what it is today) should not be misinterpreted as a "1 lane street", because it's status quo for James St N (preservation) but with tracks. It's an acceptable compromise as long as A-Line stays true express LRT towards the mountain (south of King) during any future extension. That keeps mountain access to downtown very fast, as it would only go into mixed traffic north of King towards waterfront. Very short mixed-traffic streetcar section. Which might even go dedicated again if they make Wilson-to-WestHarbour section pedestrian-only in the future, given sufficient TOD and traffic diversion over time. I forgot that Municipal Politician was now a career. There's a public meeting today at 630pm about the Centennial Neighborhoods and GO transit. Chad Collins will be there. Jason Farr, Ward 2 councillor, says the area is enough of a destination to draw people, even with one less lane of traffic. "I firmly believe that International Village, once this LRT line is complete and in full operation, will be the go-to destination in the city of Hamilton," he said. "I firmly believe that." IV BIA just won't contain any LRT stops. So Clr. Farr thinks that IV will be a destination, but without a stop right in it. Will people walk from the surrounding stops? That is the question.